This has been the order of the day ever since the Glazer family bought United in 2005 in a £790 million leveraged buy-out that loaded debt onto the club. They paid £250 million themselves, but borrowed the remaining £540 million from banks and hedge funds. 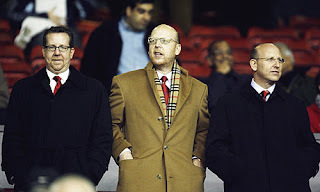 Before the men from Florida arrived, Manchester United was a thriving business, free of debt, with plenty of cash to invest, but the Glazers have effectively mortgaged the club to the hilt. Despite these financial concerns, United have managed to maintain their success on the pitch, winning the Premier League three times and the Champions League once in the last five years. However, there are now signs that all is not right with the team, as United “only” finished runners-up in last season’s Premier League, while they were eliminated in the quarter-finals of the Champions League by eventual losing finalists Bayern Munich. A pretty good performance by most teams’ standards, but not quite the levels that United fans have come to expect. In contrast, United’s support is all too familiar with the club applying liberal helpings of spin to present the financials in the best possible light. No matter how hard you look at the press release, you still won’t see the word loss appearing. Of course, at an operating level, there’s no doubt that this is a truly impressive set of figures, but the fact is that Manchester United only make profits until they make interest payments, as their enormous debts to the banks and hedge funds soak up all the profits from the playing side. 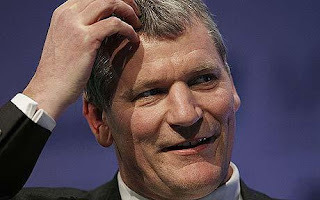 All of David Gill’s strenuous efforts to put supporters’ minds at rest only serve to raise further questions, as they ask how it is possible for a club to move from operating profits of £101 million to a loss after tax of £84 million – a massive reduction of £185 million. Nevertheless, Buffet would accept that it makes sense to focus on the free cash flow, so there is some logic to excluding non-cash expenses (or paper losses), which in United’s case amount to £84 million. Many of these are common to all football clubs, namely player amortisation £40 million and depreciation on fixed assets £9 million, but there is one large item that is virtually unique to United, which is the £35 million amortisation of goodwill resulting from the Glazers’ acquisition of the club. In accounting terms, this means that they paid more for the club than its fair value, the difference being booked as an asset called goodwill, which has to be written-off over its estimated economic life (15 years in this case). It is clear that United have no problem generating cash. In fact, the club is a veritable cash machine, which is what attracted investors in the first place, and this year they reported an excellent net cash inflow of £104 million. Although this was lower than the £111 million produced in 2008/09, that year included an advance payment of £36 million as part of the new shirt sponsorship agreement, offset by a £10 million directors loan, so it actually represents an improvement in real terms. So what do the club spend all that lovely cash on? The answer is interest payments – and lots of them. This year United’s net interest payment was a jaw-dropping £42 million, coming from seven months of interest on bank loans and five months of interest on the bond issued on 29 January. As the interest rate on the bond is higher than the bank loans it replaced, next year’s interest payment will cost even more at around £45 million. In addition, this year’s accounts include an incredible £67 million losses from exceptional items. Most of this was due to the early repayment of bank loans, which resulted in a £41 million loss on interest rate swaps and also triggered the accelerated write-off of the remaining unamortised debt issue costs of £5 million. The swap was a derivative used to hedge against movements in interest rates, but the club did not anticipate that they would fall as far as they have in the credit crunch. Although the switch from bank loans to the bond crystallised this loss, the club claim that this was still a price worth paying, as the bond will provide them with more financial stability, though they made similar noises when they refinanced just three years earlier. It will not have escaped those observers who are good with figures that the annual interest payment of £42 million plus the once-off £41 million paid for the bond issue add up to a sum that is horribly similar to the £81 million received last year when Cristiano Ronaldo was sold to Real Madrid. Fancy footwork on the wing replaced by fancy footwork on the balance sheet – how do you like them apples? "His name is Rio and he dances on the sand"
There was also a £19 million foreign exchange loss arising on the translation of the dollar denominated element of the bonds ($425 million) due to the strengthening of the dollar relative to sterling in the period since the bond issue. Importantly, this loss is not a cash expense and would not be realised until 2017 when the bond is due for repayment. Furthermore, if the dollar were to weaken against sterling, future profit and loss accounts might show a forex gain here. Of course, if the dollar were to strengthen, there would be more losses. It all depends on movements in the exchange rate. Finally, there is yet another exceptional item: a £2 million increase in an onerous lease provision on a property where the club has failed to secure an income generating tenant. Enough of all this head-spinning accounting terminology, the main point to grasp here is that there should be far fewer exceptional items in next year’s accounts, which would improve the profit (or loss) by nearly £70 million. In summary, the £101 million operating profits in the accounts have been reduced by £193 million for the following factors: (a) non-cash flow expenses £84 million; (b) interest payments £42 million; (c) exceptional items £67 million. We then add £13 million profit from player sales and deduct £4 million tax to produce the £84 million loss. Simples. Of course, all of these figures have come from the Red Football Limited accounts, so exclude the crippling interest payable on the PIK loans, which are booked in the club’s holding company, Red Football Joint Venture Limited. The club insists that these loans are the responsibility of the owners, but many commentators believe that they should be included to give the true picture of United’s total debt and interest payment, as the PIKs are secured on the club’s assets. The RFJV accounts for 2009/10 have not yet been published, but we know that last year the interest was £27 million and we can estimate £29 million for this year (14.25% on last year’s PIK debt of £202 million). That would give total annual interest of an almost unbelievable £71 million. To place that into context, this is almost twice as much as the £40 million interest payment arising from Liverpool’s equally reviled leveraged buy-out. 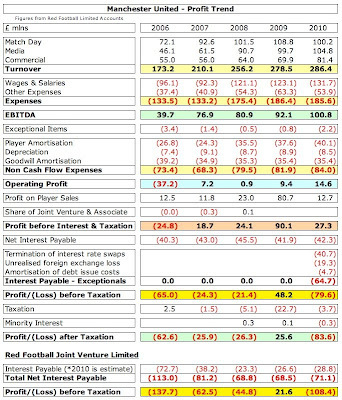 Interestingly, the only difference between the RFL and RFJV profit and loss accounts comes from that PIK interest, so that would imply a 2009/10 loss before tax of £108 million for Manchester United – not a million miles away from the “shock horror” £121 million loss made by big-spending neighbours Manchester City. This should be nothing new to Manchester United fans, as the club has reported large losses in four out of the last five years. The only exception was last year’s profit before tax of £48 million, but this would also have been a loss without the extraordinary £81 million profit on player sales, due to Ronaldo’s transfer. The huge loss was no surprise for Duncan Drasdo, chief executive of the Manchester United Supporters Trust (MUST), who lamented, “Every time these results come out, we see how much money is being wasted.” In fact, since the Glazers’ arrival, the club has paid out around £450 million in interest and bankers’ fees (£213 million interest on bank loans and bonds, £45 million exceptional charges and £190 million PIK interest). That statistic bears repeating: nearly half a billion pounds has been wasted on the privilege of the club having the Glazers as owners. Obviously, if the club had remained a PLC, then it would have had to pay out dividends, but nothing like this level. Equally plausibly, United could have been bought by a benefactor like Roman Abramovich, who has provided his club with massive interest-free loans. Some might consider that option a case of jumping out of the frying pan into the fire, but it does demonstrate the competitive disadvantage that United have suffered in comparison to Chelsea. All of the money paid to the Glazers could have been made available to strengthen the squad or keep ticket prices down, but has instead disappeared into the financial ether. The damage that the debt inflicts on United’s profits can be seen if we compare their results with those of Arsenal, who are generally regarded as the poster boy for financial excellence in the football world. To facilitate a like-for-like comparison, I have only taken Arsenal’s football business, excluding property development. The first thing that hits you is that United’s £286 million revenue is significantly higher than Arsenal’s £223 million, mainly due to commercial success. Unsurprisingly, this results in a far higher EBITDA of £101 million, which is almost twice as much as Arsenal’s £57 million. 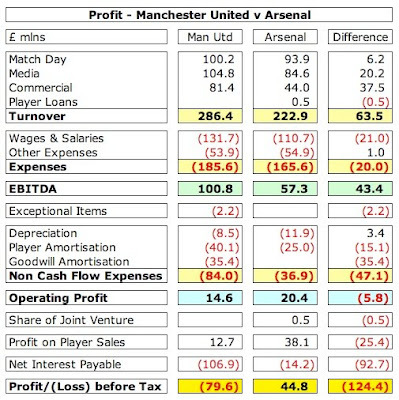 However, this is where things start getting tricky for United, as depreciation and amortisation are considerably higher, meaning that Arsenal’s £20 million operating profit is slightly better than United’s £15 million. The difference is further exacerbated by United’s shattering interest payments, allied with Arsenal’s higher profit on player sales, all of which means that Arsenal report a profit before tax of £45 million, which is £124 million better than United’s £80 million loss. Of course, the exceptional expenses exaggerate the difference in 2009/10, but the general principle will remain the same in other years. What is difficult to criticise is United’s revenue of £286 million, which is not only a record high for them, but also a record for all English clubs. As we have seen, they are a long way ahead of Arsenal, while other clubs are even further behind: Chelsea £206 million, Liverpool £185 million and Manchester City £125 million. This placed United third in last year’s Deloittes Money League (based on 2008/09 results). 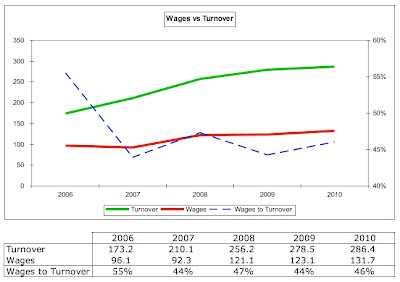 Following the slight growth in revenue in 2010, they will remain in that position when the next Money League is published. However, we should acknowledge that revenue has increased by much more this year at both Real Madrid (to £375 million) and Barcelona (to £330 million), so they are now even further ahead, though that partially depends on the vagaries of the exchange rate. In passing, I would note that Real Madrid only made a £22 million profit (though still a profit) from their huge turnover, while Barcelona (like United) reported a big loss of £68 million. Altogether now: “revenue is vanity, profit is sanity”. 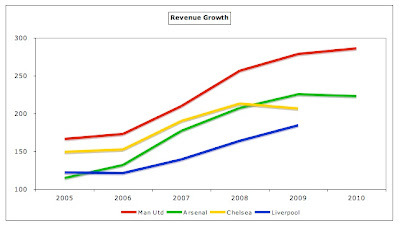 Although United’s 2010 revenue growth was very small (less than 3%), at least there was still some growth, unlike, say, Arsenal whose revenue fell actually slightly. In fact, United’s revenue growth of £120 million in the Glazer era has been mighty impressive, representing an increase of over 70%. Although you could argue that much of this is down to centrally negotiated television deals and the Old Trafford expansion that was approved by the former board, it would be churlish not to give the Glazers some credit for the rise in revenue, not least the impressive progress made in the commercial arena. Their revenue growth has certainly been better than Chelsea or Liverpool, while only Arsenal (of the Big Four) have a better 5-year growth rate at 90%, largely due to the move to a new stadium. United’s revenue has gone from strength to strength over the past few years, leading to an impressively balanced revenue mix with no single stream dominating. The revenue split is now a healthy 37% media, 35% match day and 28% commercial. This is in marked contrast to the majority of clubs in the Premier League who have a dangerous reliance on television revenue, which is why their only strategy is to avoid relegation. However, the big revenue question for United now is where the growth is going to come from in the future, as their gate receipts look maxed out and at some stage the seemingly never-ending rise in money paid for TV rights has to at least pause for thought. This explains their focus on boosting commercial revenue. 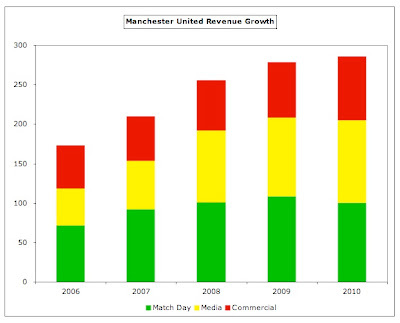 In the meantime, United’s match day revenue remains key to the core strategy, even though it actually decreased 8% in 2010 from £108 million to £100 million, primarily due to two fewer home games being played after earlier exits in the Champions League and the FA Cup. Nevertheless, it is still the highest of any European club, leading to a few truly gobsmacking comparisons: it is four times as much as Champions League winners Inter Milan, five times as much as Manchester City and seven times as much as Juventus. That’s a lot more cash – every single year. The club consistently sell-out the 76,000 capacity Old Trafford, a stadium with 16,000 more seats than the next largest English club ground, The Emirates, following extensive renovation prior to the 2006/07 season which added 8,000 seats. Known to United’s supporters as the “theatre of dreams”, I’m sure that the bean counters must fully concur with his sentiment. These price rises (and opposition to the owners) help explain why the club’s season ticket sales are down this year from 62,000 to 59,000, though this is admittedly still by no means a poor performance. It is difficult to foresee much revenue growth here, unless the club raises prices even more, especially as the hospitality market is considered to be “challenging”. There has been some talk about increasing capacity in the South Stand, but no concrete plans as yet. On the other hand, United’s media revenue increased by 5% from £100 million to £105 million in 2010, which represented good growth, especially as the 2009 comparative benefited from income for winning the FIFA World Cup (£3 million) and competing in the UEFA Super Cup. The TV money is largely made up of £53 million from the Premier League and £43 million from the Champions League. Even though United received a lower merit payment after dropping one place in the Premier League and the facility fees fell, as they were broadcast live one game less, this was more than offset by an increase in the central pot, producing an overall £1 million increase compared to 2009. The Champions League payout was also higher, even though United only reached the quarter-finals, as opposed to the final the previous year. This was largely due to the 30% increase in the UEFA broadcasting contract, boosted by the weakness of Sterling (Champions League revenue is distributed in Euros). Interestingly, United only earned slightly less than the winners Inter Milan (£45 million), as their share of the TV pool was much higher, because this is linked to the size and value of each national TV market, which is larger in England than Italy. Of course, United’s media revenue is still far below the Spanish giants, Real Madrid and Barcelona, as they are allowed to negotiate individual television deals, so earn around a third more at £135 million. Whether this arrangement endures is another question, given the pressure from other clubs in Spain to move to a collective agreement (as they have just done in Italy). This gap should be narrowed next season when United will benefit from an increase in Premier League TV revenue, as 2010/11 marks the first season of the new three-year deal, which is much higher following the astonishing increase (more than doubled) in overseas rights. The increase could be as high as £10 million a year. "So I represent value in the transfer market?" Longer-term, it’s interesting to note that have increased their stake in MUTV Limited to 66.7% “in order to have greater influence over the future strategy of the channel.” The ability to use technology to distribute live matches is definitely one of the attractions for overseas investors. Right now, the fastest growing source of revenue comes from commercial sponsors, rising by a notable 17% from £70 million to £81 million in 2010. According to the Money League, United’s annual commercial revenue is the highest in England (Liverpool £68 million, Chelsea £53 million and Arsenal £44 million), though the first two clubs’ revenue may have also grown over the last 12 months. However, although United’s marketing skills are to be applauded, they still fall well short of some continental European teams (Bayern Munich £136 million, Real Madrid £119 million and Barcelona £96 million). United’s largest sponsorship contract is with long-term kit supplier Nike, running until 2015. This was worth an average £23 million a year until 2010, but increases to £25 million for the remaining years. In addition, Nike manage the club’s merchandising, licensing and retail operations, sharing the net profits equally with United. Revenue from shirt sponsorship will also increase next year by around 40%, as the club have replaced AIG (£14 million a season) with Aon, who will pay £20 million a year until 2013/14. Only Liverpool’s £20 million deal with Standard Chartered can match this, while other clubs’ deals are far behind: Chelsea – Samsung £14 million, Spurs – Autonomy £10 million, Manchester City – Etihad £7.5 million and Arsenal – Emirates £5.5 million. The good news does not stop there, as United have signed up many new commercial partners, including the likes of Betfair, Thomas Cook and Turkish Airlines, which has produced a 50% growth in revenue from partners other than Nike and Aon. This is an example of the enduring power of the United brand globally and the club’s ability to attract new partners, despite the negative headlines arising from the Glazers’ ownership. This is hardly surprising if you believe some research conducted by TNS Sport in 2007, which estimated that United had 139 million core fans and 333 million followers worldwide. I have no idea whether those figures are accurate, but conclusive evidence of United’s popularity is evidenced by the sales figures from Nike and Adidas, which point to United (along with Real Madrid) selling more shirts globally than any other club. On the costs side, the wages growth continues apace, rising 7% to £132 million, as the increase in salaries was partially offset by a reduction in performance bonuses. In other words, if the club had matched the previous season’s successes, the wage bill would have been even higher. 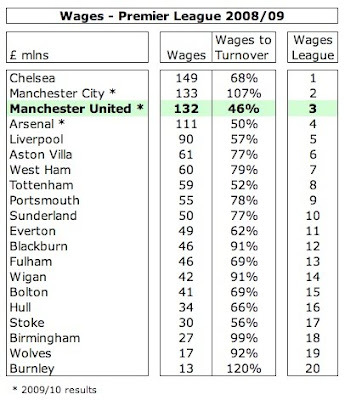 As it stands, United’s wages are now the third highest in the Premier League, having been just over-taken by Manchester City, though I would expect that difference to accelerate next year, as this summer’s arrivals are added to City’s payroll. Chelsea’s 2009 wages are still at the top of the tree, but that may change in future, as they have been off-loading some high earners. Wage bills of the top clubs on the continent are no better. In fact, they’re a lot worse with Barcelona’s “leading” the way last year with £224 million, followed by Inter £175 million and Real Madrid £159 million. Fortunately for them, they can just about afford this, as their interest payments are peanuts. However, cost control at United has been pretty good this year with other operating expenses cut by 15% to £54 million, largely due to fewer matches, but also because 2009 included once-off charges associated with the selection of the new shirt sponsor. As the club does not provide much detail to support this figure, we cannot say for certain whether any management fees to the Glazers were included here. The bond prospectus revealed that a total of £10 million management fees had been paid between July 2006 and January 2010 and £2.9 million consultancy fees in 2009, while the new agreement allows up to £6 million per annum for management fees and £3 million for “general corporate overhead expenses”. Looking at the figures, my guess is that these have not been taken in 2010. Further confirmation of United’s desire to contain costs comes from player amortisation, namely the annual cost of writing down the cost of buying new players, which is on the low side at £40 million, barely changed from the year before. This is much lower than those sides that have spent big in the transfer market, such as Manchester City £71 million, Barcelona £61 million, Real Madrid £55 million and Chelsea £49 million. This is a reflection of United’s restrained spending on new players in the past few years. Since the Glazer takeover, United’s net spend is only £11 million (according to Transfer League), which is much less than their peers with the obvious exception of Arsenal. In the same period, City’s net spend is over £300 million more, while Chelsea and Spurs have spent £100 million more. Even Liverpool, equally constrained by debt, have spent six times as much. Clearly, United’s net spend is reduced by the Ronaldo proceeds, but even so, these are telling statistics. It really does stretch fans’ credulity to breaking point when Sir Alex Ferguson claims that the reason that he has not made any marquee signings is that he cannot find any value in the transfer market. How about Mesut Ozil at £13 million or Rafael van der Vaart at £8 million? It is obvious to anyone with a pulse that the debt mountain has influenced the club’s transfer policy. This summer, the club only bought Chris Smalling, Javier “Chicharito” Hernandez and Bebe, hardly the stellar signings that the fans crave. Even after all those interest payments, the debt has not reduced. In fact, the gross debt has slightly increased this year to £522 million, though net debt has fallen to £358 million, as cash balances are higher. As we saw earlier, most analysts include the PIKs in the club’s total debt figures. Adding our estimated interest charge of £29 million to last year’s balance, the PIK debt should now stand at £231 million, which gives total gross debt of £753 million. To paraphrase Winston Churchill, “never has so much been owed by so many to so few”, but this time it’s not meant as a compliment. In January the club raised around £500 million of funds via a bond issue, which was used to repay the existing bank loans, in order to fix the club’s annual interest payments for a longer period (up to 2017) and so ensure more financial stability. However, the terms still compare badly with Arsenal’s bonds, as the debt has to be repaid quicker (7 years vs. 21 years) and the interest rate is higher (8.5% vs. 5.75%). However, this is nothing compared to the Payment in Kind (PIK) notes, which is the most expensive debt in the Premier League. The interest rate was already a stratospheric 14.25%, before it rose to an eye-watering 16.25 % this summer after United broke the covenant whereby debt was not allowed to go above 5 times EBITDA. Unlike with a normal loan, the club do not have to pay back the principal on the debt in instalments – all the money is due to be repaid in 2017. This makes it an even more expensive way to borrow, as the club must pay interest on the growing balance. In this way, when the PIKs are due for repayment, the debt will have snowballed to £588 million, giving total debt of £1.1 billion. "It's difficult to justify, sorry, explain"
The other component of debt that can sometimes be relevant to football clubs is that arising from player transfers, but this is not an issue for United, as they owe £11 million to other clubs, but are owed £13 million, so these basically net out. Given how Spanish clubs usually pay for players in a number of stages, it is a testament to the club’s negotiating skills that they received the entire Ronaldo fee from Real Madrid upfront. Included within the net debt are astounding cash balances of £164 million, even higher than last year’s £151 million, though this has been boosted by cashing the £80 million Ronaldo cheque and using very little to improve the squad plus the £36 million upfront payment from the shirt sponsor. The seasonality of the cash flow also needs to be understood, as most of the season ticket money is received before the end of June and used to pay operational expenses over the next few months. "How much is my transfer budget?" However, the question is how long will that cash be available? The bond prospectus allows the owners to take this money out of the club. Specifically, they are allowed to pay an immediate dividend of £70 million to Red Football Joint Venture Limited for “general corporate purposes, including repaying existing indebtedness” plus an additional £25 million dividend at any time. On top of this explicit £95 million, they are also permitted to pay out dividends up to 50% of net cash profits, as long as the club’s interest is still covered twice by EBITDA. The assumption is that this means using the club’s cash to pay off the prohibitively expensive PIKs. As Jonathan Moore of Evolution Securities said, “There’s still pressure on them, as 16.25% is not an insignificant coupon. You’d expect the owners to take them out as soon as they’re able to.” The results show that this has not yet happened, but it may just be a question of time, as it makes no financial sense not to do so, especially as reports indicate that other parts of their business empire are struggling, e.g. a large number of shopping malls owned by the Glazers’ First Allied Corporation have defaulted on their mortgages. Unfortunately, the Glazers appear to be determined to hang on. The vaunted Red Knights do not appear to possess the resources to mount a sufficiently attractive bid, while the Guardian has reported that the owners have already rejected several offers above £1 billion, including one of £1.5 billion from a Middle East consortium. If that were not clear enough, the board stated, “The owners remain fully committed to their long-term ownership of the club. Manchester United is not for sale and the owners will not entertain any offers.” Clearly, everything has its price and investors that employ the LBO model will normally sell when they feel that they have maximized value, so that’s unlikely to be the end of the story. Speaking of which, United are also confident that they will meet UEFA’s Financial Fair Play regulations, as most of their current losses are either once-off or of the paper variety. Gill explained the club’s assurance, “Charges related to goodwill and depreciation of fixed assets are ignored by UEFA. As a result, we can comfortably meet the qualifying criteria.” And you know what? I think he’s probably right, though it might be a close-run thing if UEFA include the PIK interest, treating RFJV as a related company. The other point that may be interesting here is that UEFA treat dividends as relevant expenses, so they should be included in the break-even calculation. That presumably means that any dividend payments that the Glazers make in order to pay off the PIKs will be included. If so, it would be in the club’s interest to make such payments in the 2010/11 accounting year, as this is the last one excluded from UEFA’s calculations. Another issue that the club has to confront is what happens if the team is less successful on the pitch? Revenue would be £40-50 million lower if the club failed to qualify for the Champions League, once gate receipts and sponsorship clauses are taken into consideration. That might seem absurd at the moment, but look what happened to Liverpool. 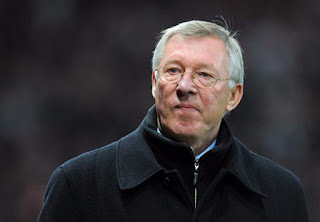 Ageing players like Edwin van der Sar, Paul Scholes, Ryan Giggs, Gary Neville and even Rio Ferdinand will all need to be replaced, while the elephant in the room is Sir Alex’s retirement. That’s a hard act to follow. Conversely, this eventuality might also offer some encouragement to United fans, as the Glazers cannot afford for the team to fail, so at this stage an appropriate amount of spending might be approved. I’ll leave you with two contrasting views. The first is a down-to-earth assessment from chief executive David Gill, “We are comfortable with the business model.” Although this statement has been greeted with hoots of derision, in a funny way he’s half-right, as United’s financials look great – right up to the point when they’re confronted by massive interest payments on the debt the Glazers brought to the club. It’s difficult to disagree with that. Good take. From my own rough calculations it seems Man Utd would this year have run a profit of £20-30M if they were not saddled with their owners' debt. A question to you Swiss Rambler: The Glazers have invested money in Manchester United for the purchase of players. My understanding is that some of this has come from the PIK loans. Am I wrong? If the loans have come from PIK loans, would that not suggest that even the footballing side is incurring football related debts? Right, I'm going to make a cuppa, then I'll come back to read it. I always need 15 minutes for your posts Swiss - it's always worth it though! Really nice stuff...i have to agree there biggest asset is Sir Alex. If he is gonne then there would be problems....Then they will have to take out money again and invest on the team. Thanks. I basically agree with you, but think that the profit might be even higher (around £50m) if you also add back the goodwill amortisation (which is a result of the takeover). This is difficult to say. As none of the money (presumably) is ring-fenced, it's all in one pot, so not entirely clear what is the source of the money used to fund transfers. Given the very strong cash flow, it is more likely that the cash used to purchase players has been generated purely by the business. Of course, if they were to spend more on players, then they might have to incur football debts. Excellent analysis, albeit long. Well worth the read, though. Cheers. Thanks, great article as per. I'm completely baffled as to why they haven't taken out the maximum to pay down the PiKs. They can take out £95m which would leave them exposed to £89m since they reportedly own 20% of the debt themselves.Presumably they can take out another dividend based on this set of results which would reduce this figure further. Great article, and very detailed. So a quick calculation at today's exchange rates leads us to a wage demand of just under £200,000 a week. 50 grand a week more than you're offering wayne rooney. Meszut ozil is a great player, the player that anderson is in his very wildest dreams, and would have been absolutely perfect for man utd, but he was just far too expensive. The first thing to point out is that the total net cash outflow on player capex has been £55m or an average of £11m per year under the Glazers ownership. That's from the independently audited accounts not some poxy website. The total gross cash expenditure on players has been £212m or £42.4m per year. Now clearly you can't form a conclusion on the level of net expenditure without considering the exceptional, world record, £80m fee from the sale of Ronaldo. Even if you were only to discount half of that fee then the average annual net cash spend goes up to £19m which is higher than the average annual spend in the last five years of the PLC. The club has also been very successful over the last five years at selling young players, acquired at minimal cost, for significant transfer fees. That all helps to bring the net expenditure figure down. The increase in staff costs also quite clearly proves that the Glazers are committed to investing heavily in the first team squad. An increase of £50m since 2005. Anyone suggesting that the PLC would be spending more money on first team squad investment is living in cloud cuckoo land. That brings me neatly onto my next point. There's this gigantic myth that the annual interest charge of £45m is ''wasted money'' and that if the Glazers hadn't bought the club, that money could be used to the benefit of the club. It's nonsense. Firstly I could quite justfiably point to at least £20m per year (currently) of increased revenue that is specific to the Glazers ownership and wouldn't have been achieved had the club remained as a PLC. 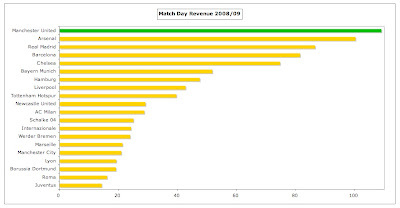 I'd break that down as £12.5m in matchday revenue and £7.5m in commercial revenue. That £12.5m of matchday revenue does of course relate to the policy of increasing ticket prices up to their equilibrium point. Not an act of genius, granted, but something that the PLC board repeatedly failed to do and was one of the main reasons for the Glazers successful LBO in the first place! I would attribute the vast majority of the £7.5m of commercial revenue to the recent policy of agreeing territory specific commercial contracts with telecommunication companies around the world. The Glazers set up a large ''in house'' commercial team back in 2008 and the results of that decision are now bearing fruit at a very impressive rate. Another £20m per year is being saved under the Glazers ownership model compared to that of the PLC due to the corporation tax savings and the dividends which are no longer required to be paid out to shareholders. You don't even mention the significant corporation tax savings that the club has benefited from under the Glazers ownership structure. I have to ask myself, is this a serious financial analysis or are you simply playing to the crowd with a populist stance? So when you take that £40m into consideration, the net negative affect to the club itself of the Glazers ownership is just £5m pa. And what price the streamlined decision making process of the Glazers private ownership structure compared to the very public and unsuitable processes of the PLC? It is abundantly clear that the negatives of the Glazers ownership model have been blown out of all proportion. 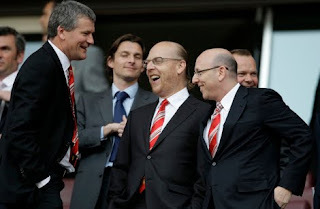 This has been an extremely successful LBO for the Glazer family and the club itself has done perfectly well out of it. I look forward to May and title number 19. If the Glaziers funded the purchase through equity and paid themselves a reasonable dividend the bottom line would be in better shape but less would be invested in new players etc. Ultimately shareholders expect a better return than bond holders so the idea that all clubs need to do is get new equity to pay off debt is false. This is complicated by the most valuable asset a football club has, its brand. The brand can be considered a fixed asset thus as it increases in value this should lead to capital growth but there is more written rubbish about brand valuation than football finance except in this blog. Point taken on use of a website instead of the accounts for player trading. Reason I did this was to incorporate this summer's transfers. Transfer figures are indeed notoriously inaccurate, but I don't think that they affect the general point I made, which is that United have spent much less than their rivals (except Arsenal). However, I don't think you can exclude Ronaldo from the calculation, just because it's a high fee. Where do you draw the line? 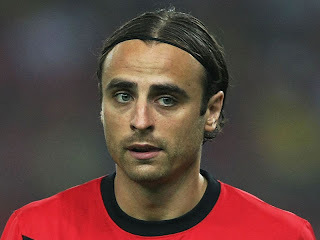 Should we also remove Berbatov, for example, from the purchases? By the way, although the audited accounts should be more accurate, you are referring to cash flow, which in the early years of the Glazer ownership might well refer to purchases made under the former regime (stage payments, fees contingent on appearances, etc), so even those figures are not as crystal clear as you suggest. I maintain that the amortisation is on the low side relative to other top clubs and provided figures to support that point. Having said that, I accept your argument that this has been sufficiently competitive in the past few years (the honours board support that), though we'll never know whether even more trophies would have been won with a couple more world class players. Yes, the wage bill has increased at United, but this is true for every club. Not sure if you actually read what I wrote about the revenue growth, but I did actually give the Glazers credit for this, especially in the commercial area, though some might argue that any management team worth its salt would have grasped this opportunity. I accept that corporation tax is an important factor, but don't rally understand your argument. Are you suggesting that it's preferable for a company to have interest charges of £45m, as this would produce tax savings of £15m? That still gives a net cost of £30m. As you say, there's no doubt that this is an extremely successful LBO for the Glazer family, but that's never really been the issue. A question: you say that the £35 million amortization for goodwill in the accounts reflects the Glazers paying more than fair value to acquire the club. As this is being written off over 15 years, does this mean the Glazers overpaid by £35 million x 15, or £525 million? Or is there some other point you are making here? I don't understand anonymous' comment. In saying that the owners have constrained Man Utd, one assumes that the club which was already very profitable would have continued to be so. But s/he assumes the contrary i.e. that the club would not have reached current levels of revenues without the owners. While I take on board the fact that the Glazers recruited a strong commercial team which has been successful, it would seem that it wasn't beyond the reach of any other owners to put together a strong commercial team since many many other clubs have seen similar commercial growth. These are all counterfactuals, but it's remarkably easy to take away the impact of the Glazers debt, and see the figures on the Man United accounts change boldly from red to black. It's not so much that they over-paid, but goodwill represents the difference between the price the Glazers paid and the book value of the net assets at the time. Accountants often use the phrase "fair value", but it's really net book value. This difference reflects things like the brand, future earnings potential and under-valuation of players. 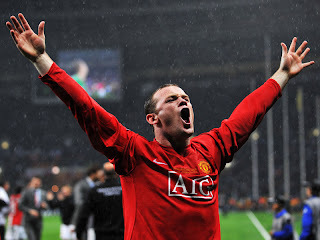 Just to take the last example, Wayne Rooney was bought in the summer of 2004, so his transfer fee is now probably fully amortised (or very nearly), meaning that his value in the accounts will be hardly anything, while he could be sold for (guess) £40m. As you say, the implication of £35m annual amortisation for 15 years is £525m goodwill. This is confirmed by the accounts showing £530m (some rounding). The 15 years is not really important, but I wanted to include it to show that this non-cash expense will be included in United's accounts for many years. In other words, it's not a once-off. Can you elaborate on the details mentioned in passing on Nike / Adidas sales, and sources? Mate, GCHQ is a Glazer stooge. You know that already. If you could politely inform GCHQ to get fucked, we'd all be grateful. I have been following your blog for a while now. It is very nice to see well articulated analysis on sports economics. Good job. I am writing my bachelor-thesis about the UEFA Financial Fair Play Regulations, where I among other things analyze on 3 teams i the PL: Chelsea FC, Man. City and Man Utd. I have been searching the web for the Man Utd. Annual Report 2009/10 without any luck. I know that it is a private owned company, and therefore it may be difficult to get my hands on it. Perhaps you have the report in pdf, that you could e-mail me? Excellent blog as usual Swiss Ramble. Sums things up very neatly. Thanks. ps. Ignore GCHQ, he works for the Glazers and spams many forums and blogs with his pro-Glazer claptrap. Great article I know its a horrible thing to say but its kinda a blessing the Glaziers did take over and saddle the club with massive debts, as they have been so successfully even with this handicap god knows what players they would have kept (Ronaldo) or purchased to make them even better. I'm a gunner true and true but the reality is Utd are the blue print of how the run a football club..... taken the Glaziers out of the equtation, there income generating especially commerically and promoting the brand Utd has been increible. Hopefully Arsenal focus on improving this area which has been neglected. So here's GCHQ openly boasting that the Glazers' lasting legacy is increased ticket prices and a fuckload of debt. Can you confirm (or deny) Gill's assertion that “Charges related to goodwill and depreciation of fixed assets are ignored by UEFA.” - does the FFP regulations make that explicit? or is Gill engaging in 'wishful thinking'. Additionally, is there any clarification on the PIK loans on this matter too? I think that Gill is correct in his view that depreciation and goodwill charges will be excluded from the UEFA Financial Fair Play break-even calculation - and I have read the entire 86 page document several times. b) Amortisation / Impairment of intangible fixed assets other than player registrations"
So, it's crystal clear on depreciation of fixed assets, while part (b) on intangible assets should include goodwill (which is an intangible asset). I don't think that the valuation that was put on the company (£790m) when it was bought by the Glazers, which created the goodwill, will have an influence on this. "Dividends are distributions to holders of equity instruments. If dividends are recognised in the financial statements then, regardless of whether the dividends are presented in the profit and loss account or an alternative statement, the amount of dividends must be included as relevant expenses." So, theoretically, any dividend payment should be included. If that is the case, then it would make sense for United to ensure that they made the dividend payment before UEFA's FFP regulations came into force. As the first year's accounts that are included are 2011/12, that only leaves the next financial year as a possibility, namely 2010/11. In other words, if the Glazers are indeed going to use United's cash to pay off the PIKs, then they would do it before the end of June 2011. Having said that, from a financial perspective, they should have done it already. Still trying to get my head around this accounting malarkey so correct me if I'm wrong. Isn't the amortisation of goodwill thing is good for the club? Unlike the other non-cash loss, we do not have to spend any further cash on it (player amortisation: have to spend on new players & depreciation: have to replace old stuff). Therefore having that 35m accounting losses every year would be good thing, since it does not cost anything and would reduce the tax since it is count as a loss. Thx Swiss for clearing the muddy waters a little. One thing is for certain, should i ever find myself in the very fortunate position of inheriting a £1M diamond, i will consult their people to argue that since it is only carbon I should only be paying inheritance tax on the carbon value, say £5 for a bag of coal. That is how it seems to me. The idea that they can discount £530M of the £790M purchase price and the debt repayment associated - because it suits them seems unreasonable. Will UEFA (or HMRC if it has tax implications) question this valuation? A quick question on amortisation. (I should have posted this after the previos article) How would amortisation work if a club did a swap deal for a player? For arguments sake if Man City swapped Adebayor for Higuain of Real Madrid. So instead of City having a player with a £5M annual transfer amortisaton (25m spread over 5 years)they would gain someone who cost them nothing. Would this take their amortisation fee down by 5 million per year? You did it again...I really enjoyed reading it..
Bayern [Rummenigge] announced Bayern turnover for 2009/2010 will be in area of €350mil.. So do you think that could be true? I am a reporter for one of the leading FC Bayern forums and I would really love to see similar article on Bayern finances. I know you wrote one article about Bayern [How can Bayern afford Ribery`s wages? or similar]. Any idea if H&G will walk away with a nett profit or loss from Liverpool, given the obscene "Consultancy Fees" they and their associates have received. Perhaps your next post? When the purchase of a player involves a non-cash consideration, such as a player in part-exchange or a player swap, then the transaction is accounted for using an estimate of the player’s market value. This is obviously open to some manipulation, but not too much, otherwise the value would be questioned by the club’s auditors. As an example, when Samuel Eto'o was given to Inter by Barcelona as part of the price paid for Zlatan Ibrahimovic, Inter ascribed Eto'o a value of €20m in the accounts. He signed a 5 year contract, so the annual amortisation is €4m. Yes, it's possible that Bayern will overtake United in the Money League, but we need to see a split of that €350m revenue, as it probably includes profit on player sales, which is excluded from Deloittes' revenue analysis. I will certainly write about Liverpool again, but I think that it would be better to wait until the (legal) smoke clears. If I wrote anything now, it would just end up as a lengthy series of unanswered questions. Ok, so a blunt question: Are United in trouble? I mean, if Ferguson leaves and their form slips, they go out of the champions league maybe...that billion worth of debt is going to really start to hurt. Could it destroy United? Far as I can see, the only reason Hicks and Gillette and the Glazers did these leveraged buy outs in the first place was so that they could siphon lots of money away from the two clubs untill they lost them, potentially earning them hundreds of millions from the decline of the football club. Take Liverpools case, in which the club owes a significant amount to Kop Cayman (Hicks) owned which charges significant interest to the club, basically again for having Hicks as an owner. It basically points to them getting the club for free, sucking a few hundred million out of it and them letting the club die. And I off the mark? Another superb read as always. As an Arsenal fan, it makes me appreciate how well the club I support is run and count our blessings that we have owners / shareholders that work only for its benefit, rather than bleeding it try. Hope it stays that way! Are you self employed accountant? I would say not, though the business model would be endangered if they failed to qualify for the Champions League. Unlikely, but stranger things have happened. Thanks. I am indeed a qualified accountant and have held many senior finance roles (CFO, Finance Manager, Strategic Planning, Risk Management, Audit), but am now a consultant. The exact numbers are (of course) not out yet, but Rummenigge said it would be well in excess of € 300 M, over € 350 if you included the numbers from the stadium company (the difference between these were € 35 M last year), which DFML does. This will as you say probably include player sales, but that was only about € 23 M in 2009/10, including the catastrophe of offloading Lucio for € 7 M (I actually shouldn't even mention it so close to bedtime, good thing I don't have nightmares usually). So, while taking Rummenigge at his word, but not exaggerating, we should probably see Bayern reaching or surpassing € 330 M in income in the 2009/10 accounting year. Oh, great article again btw. I truly enjoy reading your analysis and want to thank you for putting the time and energy into your blog. I have to admit, however, that I get rather sick to my stomach when I read about the commercial success teams other than Arsenal enjoy. I understand the Emirates deal was somewhat front-loaded, but it is a terrible deal for Arsenal, as is the Nike deal. Very poor job by AFC. "It is obvious to anyone with a pulse that the debt mountain has influenced the club’s transfer policy. This summer, the club only bought Chris Smalling, Javier “Chicharito” Hernandez and Bebe, hardly the stellar signings that the fans crave." I just checked, and I have a pulse - but it's not obvious to me that Fergie's working under any constraints that aren't of his own making. He used to say that United had £30 million to spend each summer. 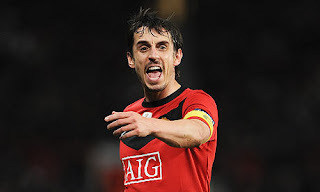 The three signings you mention are said to have cost £24 million, and between them his oldies - Neville, Scholes, Giggs, and Owen - are taking home the other £6 million a year and then some. Asusual, the best financial insights into the premiership. Can't wait for your take on Liverpool. A club the American crooks bought for 174m at the peak of the bubble when Liverpool were riding high, now suing everyone in sight (ably oposed by the beautifully named Slaughter and May - Sue, Grabbit and Run???) beause a relegation-threatended bunch of also-rans only command 300m. What a story!!! One of your best posts yet, I can't thank you enough for sharing your insights, I've learned more about football's financial aspects since I discovered your blog than in my previous 25 years as a football afficionado. I have a small question though, you did not mention the UEFA fair play rules. Considering the current bleeding and the upcoming need to replace all the ageing players, is there any chance that United can clear the hurdle without having to sell some of their star players? Are these kind of leveraged buyouts normal in the business world? Do they make money? Do the debts *ever* get paid off? Where's the precedent for a successful sports team bought with a LBO that went on to stay successful and actually pay the debt off? Hey Swiss what a great read as always =),btw do you mind showing me the steps to acquire ManUtd's return on equity for the 2009/2010 financial period, ended 30/6/10? I went through the 2009/2010 statutory account and realized that the EBITA is 100.8 M and closing owners equity (shareholder's fund?) is 779.914 M, therefore shall ROE be 100.8/779.914 = 12.92 %? , as far i am concern there is a loss too of (83,639 M), and unsure about which figure to use in this calculation. Thx for your help in clearing this for me, i am currently doing my Masters and plan to write a dissertation accessing the impact of foreign ownership on club managerial approach as well as future performances. just found your blog, it gives much insight into a part of the game I did not recognise so much - the finances of football clubs. I'm a supporter of German club Borussia Dortmund. Could you make "my" club a subject in a future posting? That would be awesome! This would be interesting to me as I don't have as much knowledge in reading and interpreting financial reports. As you might know Borussia Dortmund almost went bankrupt in 2004/ 2005. I still wonder how they restructured their finances, how they repayed debt and how much debt is left today - are they repaying a sum every year, so debt gets lower? If you read today's balance sheet, is the club 100% healthy now? And then the big rival FC Schalke 04: Many people are saying the club is at an almost desperate financial situation as Dortmund was back then. It is said that if they don't score a place that qualifies for international competition, they are going bankrupt. Is it true or not? They are only 16th place right now in a serious crisis, far away from the top positions. Can you give an insight in their financials - maybe compare to Borussia Dortmund back then? If you're not an expert - like me - you just don't know whom you can believe in the case of "Schalke 04". Great blog in general Swiss and another great article. The Andersred blog has an analysis of cashflow and points to the early payments on the Aon and other commercial deals as having artificially enhanced this years figures by around £15m. This appears to have been part of the attempt to dodge the increase in PIK interest rate to 16.25% that failed earlier in the year. The point I'd like clarifying is that this will likely drop EBITDA to £85m in the next results if everything stays the same. With interest charges at $50m and fixed, does this mean EBITDA must be over £100m for the Glazers to be able to add to the dividends pot that they can plunder? With this years results that pot will have grown to around £120m. I can see that for PR reasons the Glazers wouldn't want to have shown their hands too early in drawing this money, but with over £200m at 16.25% they will surely draw a large chunk of it over the next year or two to pay down the capital. Even at £100m left in the PIK loans the interest payments will still be £16.25m. If £100m is the minimum EBITDA figure to trigger dividends, then those dividends would presumably be a minimum of £25m given the 50% of EBITDA-interest formula. In reality I can't see the Glazers taking the full £120m up front given the potential fall-out and impact on Uniteds ability to acquire and retain players. This probably means that the £25m would be required just to keep things at par. With the growth in TV revenue perhaps that is a realistic objective, with around £10m this year and maybe more commercial magic the EBITDA figure could be achieved. By 2017 they would then have to refinance the £500m bond and something like £150m in PIK loans. That would probably end up costing less than the current £50m per annum and might be regarded as a bit of a result all round for the Glazers who would certainly have a fairly large net equity position. Of course this all hinges on continued success on the pitch and being able to leverage the cash that is available into sustaining that success. 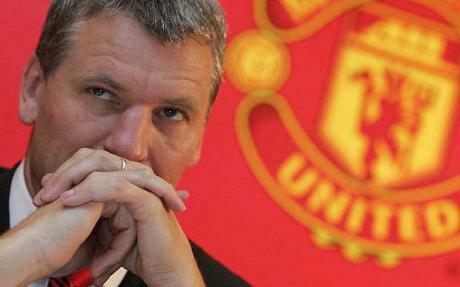 Not impossible but the choice of successor to Fergie is going to have to be a good one. I think I'll quote Horace Rumpole, who once remarked, "I think the prosecution can take the rest of the day off." Thanks for your kind words, though I did actually mention the UEFA Financial Fair Play rules towards the end of the article. In short, I think that United will conform, as they will be able to exclude certain costs like depreciation on fixed assets and amortisation of goodwill. I explain this a little more in one of the responses to a question above. I don't want to be awkward, but if you are doing a Masters, then you should really know all about return on equity, no? I would like to take a look at another German club at some stage, but I have a backlog of requests now, so can't promise when that will be. Schalke are interesting because of their financial issues, but Dortmund is also a possibility. Yes, the payment in advance from Aon has indeed boosted the cash balance, but the profit (and EBITDA) is unaffected by the advance payment. The revenue would only have shown £20m, even though £36m cash is received. The difference of £16m is booked in Deferred Income on the balance sheet. It's a bot technical, but what it means is that the amount booked in next year's profit and loss account for the Aon sponsorship will be the same (all other things being equal), so the EBITDA will not fall. As I think you are suggesting, the bond prospectus allows the Glazers to take out £95m of dividends regardless of how EBITDA performs. The issue is that they are permitted to pay out dividends up to 50% of net cash profits on top of that - as long as the club’s interest is still covered twice by EBITDA. Remember that the PIKs are held in another company (RFJV), so this formula only applies to the interest on the bond issue, which should be around £45m next year. As EBITDA is currently over £100m, the chances are that they will be able to use this provision to pay out additional dividends. But stadium company is part of Bayern Munchen EV so that should also be counted into revenue although it is a separate company...but it is owned by the club. It would be like not including Emirates stadium into Arsenal financial report. I think that Allianz Arena company was established just because they did not want to connect the debt to the club so that Allianz Arena would pay for itself. But money coming in from Museum, Stadium tours, restaurants, bars, shops as they earn that money mostly on match days..should be included in commercial revenue or am I wrong? Like Ulli said..."Once the Allianz Arena is payed off we will be the richest club in the world"
He wouldnt say that if he did not think that revenue coming from Allianz Arena company is not quite high and he intends to join it with Bayern Munchen E.V. company. Yes, the revenue from Allianz Arena is included in Bayern's consolidated figures within commercial revenue in the Money League. The Allianz company figures last year were €35m revenue, €21m operating profit and €10m loss (after €30m interest charges). could u kindly help me on the calculation?just let me know whether its wrong or right.BTW my 1st degree wasn't in business so i am a little behind my management buddies. Thanks for the blog. It's a very interesting insight into the club and a refreshing alternative to the poor coverage provided by most of the British media (though I see it has made the Guardian sports' page's "favourite article of the week" - kudos to you). Admittedly much of the accountancy jargon goes over my head but I like to think that I got the general jist of it. I would like to inquire as to why you believe the Glazers have not taken out a loan to cover the PIK loan. Paying such a high interest amount seems like financial madness. Wasn't the bond prospectus twice over-prescribed - therefore shouldn't the Glazers raise enough confidence to acquire a loan against the clubs assets at a much lower interest rate? My own belief is that the Glazers taking the £95m out of the club could lead to a massive fan revolt. For the moment the club are still dependent on fans turning up in full numbers. Not sure, but I think the bond and the PIK are held by different companies, and there are conditions attached to the bond relating to player purchases and cash balances which might have gotten in the way. What happens if Rooney goes for 5mill??? Slowjoe is correct - the PIK loans are held in a separate company. 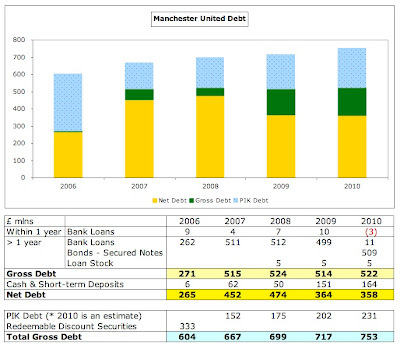 Arguably, the Glazers could have raised more money against the club with a higher bond issue, but this would have been problematic for two reasons: (a) the amount raised is a delicate balancing act - any more would probably have required a higher yield and might have been more difficult to get away; (b) it could have upset fans even more by making the link between the club and the PIKs clearer. Your articles are a service to the football community! The topical issue now is whether the sale of Rooney will follow the pattern of Ronaldo's sale. Will United re-invest the proceeds to rebuild the club or will the Glazers use it to pay down the debt, particularly the PIK's? If the squad is not reinforced, they could have trouble maintaining a top four, CL spot. It is starting to look like it is only Arsenal and the oiligarchic financial dopers, ManCity and Chelsea, who can compete for the PL--at least until the Fair Play rules impose greater restraint. It is only year two of ManU's project of learning to live like Arsenal and danger signs are on the horizon. Who is better at managing on a restricted budget, Ferguson or Wenger? We are about to find out. And, if Fergie leaves soon without rebuilding the squad and stocking it with young players who can be developed over the next few years, it could be a huge problem until the Glazer debt is removed. Well, the new five year contract for Rooney throws a wrinkle into the mix. It could be a compromise like the Ronaldo deal--keep quiet, play (recover your form in this case), and let the club get good value for selling you at the end of the season. Decent analysis but does not come across aS A neutral picture of the situation. I alwasy think of accountants as level headed types who don't let MUST and their agenda influence their thinking. stop being silly nothing wrong with the debts, if SAF says we are ok then we are, he would not lie to us fans at the risk of ruin our great club. As an accountant/auditor in training with Deloitte I once wrote an article on this issue for www.trulyreds.com, but this pisses on that from a great height! I've had a moral dilemma over the last few years regarding whether to join MUST. On the one hand I can clearly see their arguments, but on the other some of their less informed members do chat some nonsense and put me off their side. That and, in a way, there's nothing wrong with what the Glazer's have done (get a loan, buy a business, use profits to pay off the debt). However, this article has decisively settled the argument for me, and with there being a planned protest before the Tottenham game I'll distribute it as much as I can! But will I be renewing my season ticket? Of course, support the team no matter what. This article was quoted and mentioned in this bbc forum article. The poster attempted to take the points from this article but two fellas have challenged some of the points you've made with their own view that you have 'a bone to grind with the Glazers'. I realise you enjoy doing articles on various clubs but maybe, if there's time, it might be possible for you to address some of the arguments here. Thanks for the input though - fascinating reading. Thanks for the heads-up, but I don't think that I'll get involved in the mud-slinging on that forum. 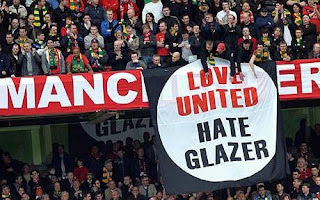 All I would say is that I'm not sure why I would have "an axe to grind" with the Glazers, given that I am an Arsenal fan. Mine is a balanced review of the financials, giving United's business model a lot of credit where it's due, but also raising valid points of criticism, in particular noting that significant sums of money have left the club that could have been put to better use. How can Inter, Milan and Juventus earn more money from TV revenues than Chelsea??? Because they have higher domestic TV deals. Up until season 2010/11, the top Italian clubs benefitted from individual TV agreements, as opposed to the Premier League's collective bargaining. If you want to know more, I go into further detail in the articles that I wrote about each of the clubs you named. You're right. TV deals were still individual last season. Thanks anyway. And keep up the good work, you're doing an amazing job. It would be very interesting to get a post PIK loans payment comment in regards of the Glazers and their ownership. i have to agree their biggest asset is Ferguson. If he is gone then there will be problems. Awesome Post!! Your analysis was really great. Both Chelsea and United have a weaker squad than Arsenal, Citeh and probably even Spurs. It is to the great credit of their managers that they have performed so well (despite the recent slump for chelsea) this season. United have been absolutely mediocre this season and we are very lucky the competition has also been so this season. And Fergie really did great with the Rooney situation! I totally agree with one of the comments that the biggest risk is ill health or retirement of Fergie. He has shown time and time again his ability to man-manage, build new teams, have success in the short term but with an eye on the long term and just as importantly, pee off his noisy neighbors and so keep the fans loyal thru and thru! Another great article from you. I dont often comment but i always read. Great piece. If Fergie continues to show reticence over spending big with his policy of spending less (by bringing in younger players as opposed to established stars), wouldn't the club be better off paying off some of its debts instead (as galling as the prospect sounds to many of the club's fans), thus reducing interest payments? The cash reserve of £100M+ has been there untouched for nearly two years now. Just recently discovered your blog and felt compelled to thank you for all your effort. 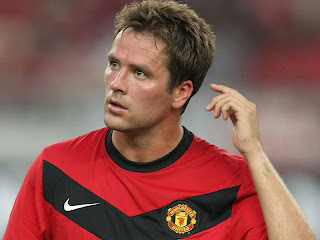 Were you as surprised as most of us United supporters when the PIKs were repayed with money from outside the club? Thanks. It was no great surprise that the PIKs were repaid, given the punitive interest rates, but I was a little surprised that they did not use some of the cash balances, even though this would have been a massive PR own goal for the Glazers. Can you shed some light on what the fluctuating prices of the bonds issued by the glazers amid this speculation about Qatar? Are the rising prices of the bonds good or bad from the clubs point of view. Also, do you know when the next quarterly accounts are out? Should we not also look at the balance sheet? What is the net asset position and how much has it declined since the Glazers took over. There must be a limit to the cumulative losses the business can sustain. I'd like you to shed some light on the recently released Man Utd figures and know what it means for Man Utd in long term with the coming floatation. I take most of the financial data directly from club accounts and create the graphs myself.